Museums serve the purpose of educating and creating awareness among the people about our rich history and culture. In India, the trend of Museum has increased and the common man has an easy access to disclose the hidden history by visiting the nearest Museum. There are various national, state, district, government, private Museums, etc far across India. One such Museum today we are going to see is ‘The Chennai Government Museum’. It got started in 1851 and is second oldest Museum in India. Let us see few of the features of this Museum. The Museum consists of six buildings and 46 galleries covering the area of 16.25 acres. It has various sections of Numismatics, Geology, Anthropology, Botany, Archaeology, Zoology, Sculptures, Manuscripts, Paintings, etc. 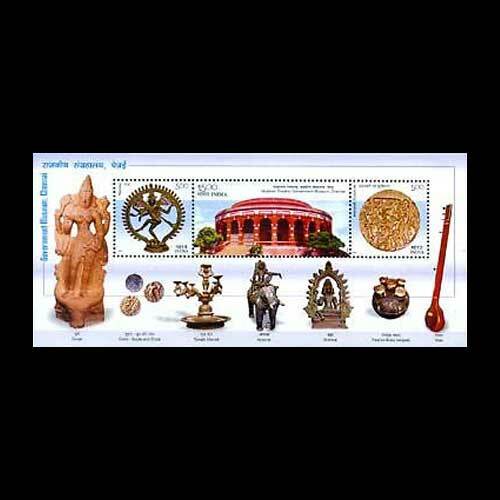 To honour this gigantic Government Museum of Chennai, India Post issued a miniature sheet of INR 25. It depicts the mesmerizing Museum with all the rare artefacts around it. So when are you planning to visit this Museum? To know more stay tuned to our website.